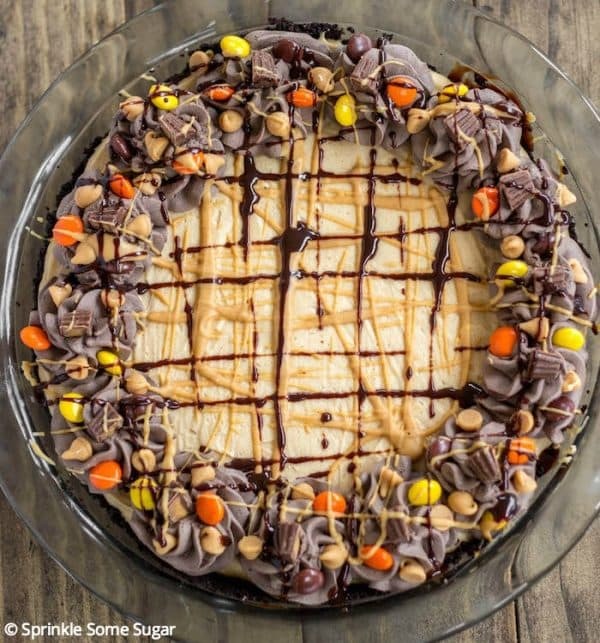 Easy Peanut Butter Pie - Chocolate Chocolate and More! 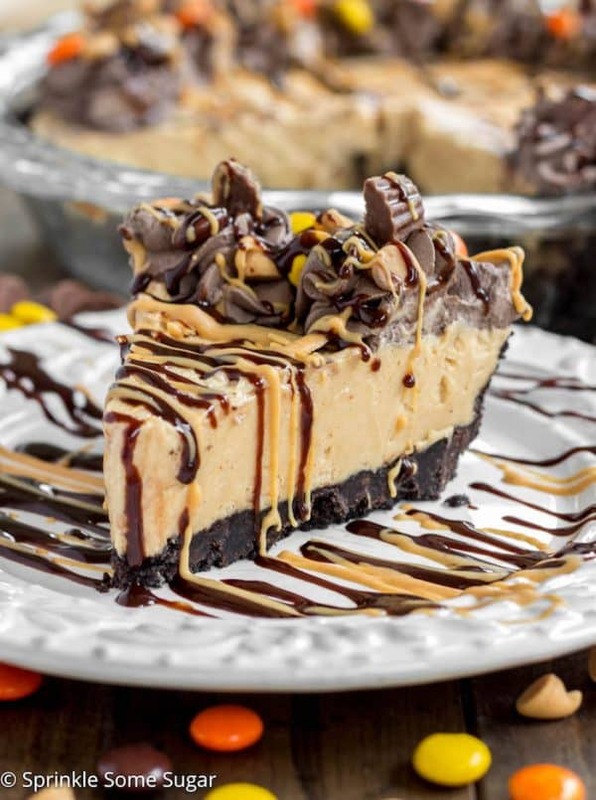 A creamy peanut butter pie filling is nestled in an Oreo crust and topped with a dark chocolate whipped cream. Hey guys! Jessica from Sprinkle Some Sugar here. Ohhhh man, you guys. Have I got a treat for you today! 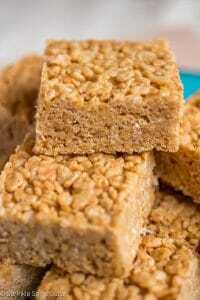 I just love easy recipes for when I’m in a pinch and need a quick recipe. This recipe is almost no-bake, you’ll just need to bake the crust. I like a firmer crust so it stays together but if you don’t mind a crumbly crust, you don’t even need to bake it! Which makes this pie even easier. To prep this dessert, you’ll start by pulsing the Oreos and butter together and pressing them into a lightly greased pie plate. If you choose to bake it, it’ll bake for 10 minutes and then you’ll need to cool it completely before filling. To make the filling, you’ll whip everything up in a big bowl and just pour it into the cooled crust. Refrigerate for a few hours or preferably overnight and there ya go! A super easy and AMAZINGLY delicious dessert that comes together super quick. Before serving you can whip up some dark chocolate whipped cream to garnish the top with for extra deliciousness. IF BAKING CRUST Preheat oven to 350 degrees. For the filling, beat cream cheese and peanut butter together until smooth with no lumps. Add confectioner's sugar and vanilla and beat again until smooth. In a separate bowl, whip heavy cream until stiff peaks form. Fold into peanut butter mixture until fully combined. Pour into completely cooled crust. Refrigerate for 4-6 hours or preferably overnight. 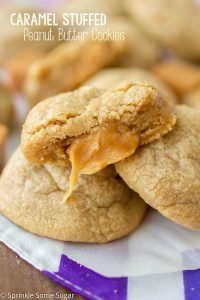 If you loved this recipe, check out these other peanut butter recipes! what did you use for the drizzle decoration on top? Melted peanut butter and chocolate syrup. how would one make the icing lines like on the one in the pictures? I think she used Reeses Peanut Butter Syrup and Hershey’s chocolate syrup. 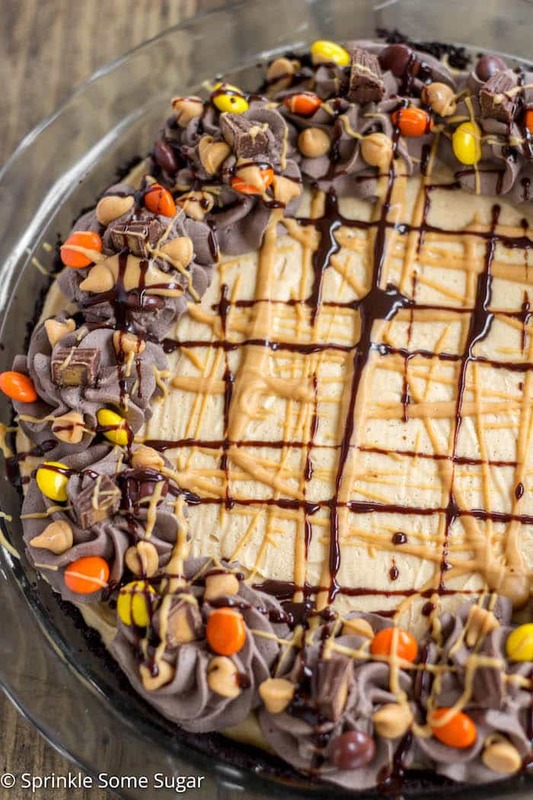 You can drizzle the peanut butter using a spoon and drizzle the chocolate syrup from the bottle in lines. What did you use for the drizzle decoration on the top? This pie looks absolutely SPECTACULAR! I’m such a pb/choc fanatic so this is really singing to me!